Let me just start off by saying: wow, what a great title that is! Yes, of course for those of you in the know, that is indeed the title of a very cool retrospective book on all things Tom Gabriel Fischer (aka’ Tom G. Warrior as he is known in the Metal world). Only Death is Real is an illustrated history of Hellhammer and early Celtic Frost circa’ 1981-1985. This book covers pretty much everything you always wanted to know about this innovative Swiss group. I don’t want to leave out two other key members. Bassist Martin Eric Ain, who helped Fischer put the book together along with contributions from drummer Bruce Day. 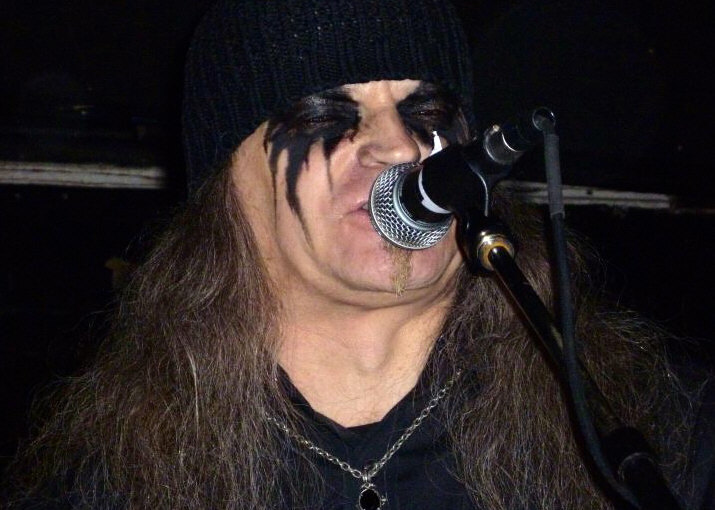 The book, which was released last year  also features an extensive appendix that includes some unique Celtic Frost and Hellhammer items, including old demo covers, logo ideas other misc. design concepts etc. There are lots of interesting items to feast your eyes on! In a nutshell, it’s a great book. But this post is not specifically about the band(s) or even the book itself. It’s about a page in the book and it’s contents—a page in time if you will. Let us focus on the following excerpt. From page 109 of Only Death Is Real. 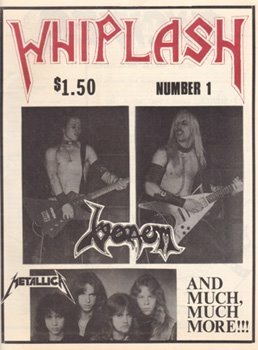 Notice that Whiplash was one of the few fanzines worldwide who received the very first Hellhammer demos —only two of which made it to these shores! I would like to personally thank Brian Lew (and Sam Kress R.I.P.) for not only being the inspiration for 50% of this article but also for creating and putting out the Whiplash zine’ back in the 80’s and for the detailed documentation that Brian has done for the 80’s Metal scene for so many years. Brian is also responsible for the Xeroxed fanzine called ümlaut, which was a Bay Area zine’ that was launched in the early 90’s and covered everyone from Metallica to Sonic Youth. I take great pride in my Vault of treasured Metal items, but hats off to Brian and all things ümlaut, as they are one of the very few blogs out there in Metal land who are able to “one-up” Demolish on a regular basis! 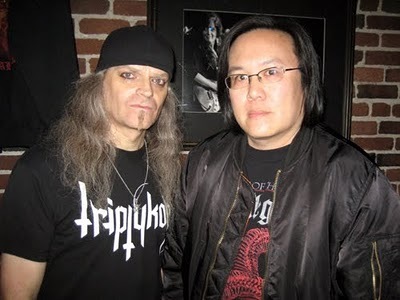 I especially like the full circle retrospectives such as the recent Procreation of the Wicked post, where he writes about a recent Triptykon show in Cali and get’s to finally meet Mr. Tom G Warrior in the flesh after all these years. Check out the excerpt below. Ah, I see you peeped the first name on the list—Alex Gernandt, who I happen to be corresponding with as of late for a special retrospective article on him. So the timing of this post from Brian struck me as odd or perhaps a case of “perfect timing” and or some sort of strange [nostalgic/cosmic] synchronicity perhaps! 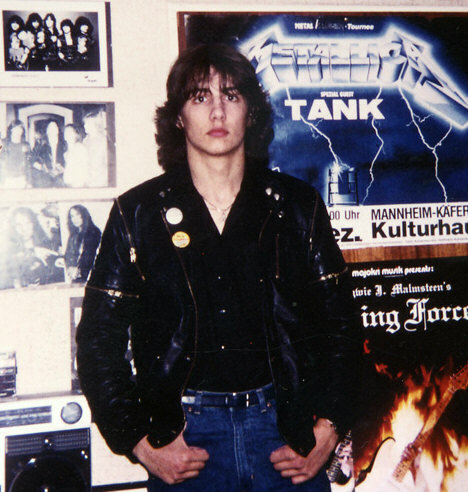 Either way, Alex, who was a founder of the German fanzine Shock Power was also among the very few to receive an original Hellhammer demo and package. Alex had casually mentioned the encounter with all things Hellhammer + the Frost a while back via email correspondence but it did not really “sink in” until I read the book with my own [four] eyes! Times were much different back when. There wasn’t a band on every corner playing Thrash (or simply “Speed Metal” as it was once called), let alone Black Metal. As a matter of fact “Death Metal” wasn’t even coined yet! But there you had Hellhammer, a band whose humble beginnings would arguably become the blueprint for Black/Death some years later. “One day, I got a call from a Berlin rock label by the name of Noise/Modern music. The guy asked me what the heaviest unsigned band was. I told him: “Hellhammer from Switzerland” and gave him a contact. 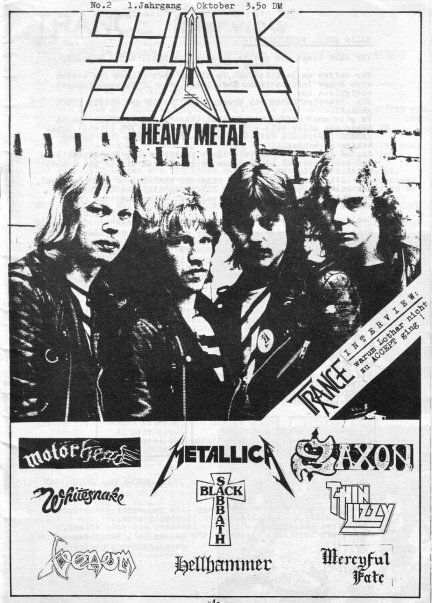 This led to the first ever record deal for Hellhammer… I was 17 then” states Alex. Wow, how would you like to be the one who gets to carry that Metal memory around for your entire life! For all the folks who can relate or would like to have their own copy of this amazing book [with amazing photos and stories] from the one and only Tom G. Warrior -a true Metal legend if there ever was one, go here now! *Thanks again to Brian for the inspiration and to Alex for sharing his valuable time and memories! Stay tuned readers, as [with a bit of luck] we might have more special in-depth articles posted about these two gentleman in the future! This entry was posted in Demolish A.D. and tagged Alex Gernandt, ümlaut, Bazillion Points Publishing, Black Metal, Brian Lew, Celtic Frost, Death Metal, Extreme Metal, Hellhammer, Martin Kyburz, Metal memories, modern Extreme Metal, Music, Only Death Is Real, Shock Power fanzine, Tom G. Warrior, Tom Gabriel Fischer, Triptykon, Whiplash Fanzine. Bookmark the permalink. Awesome! It wasn’t until the day of the show that I even knew about the book. MUST…BUY…ASAP! I love not only the historical depth of this story, but the fact that it continues forward to this day, expanding to include fans like me. What generosity and courage there is worldwide by many to keep this story going! I obtain a lot in your website really thank your very much.